Quentin Pickard has provided this colour photo which shows the former Wesleyan Chapel at 234a High Street. When built this would have been obscured by the High Street properties and it was accessed by 'a passage' from the High Street running between numbers 234 and 235. There is a similar view (black and white) taken in the late 1960s in 'Then and Now Brentford', Carolyn and Peter Hammond, and the accompanying text notes the chapel building was demolished in 1977. It seems the site was left empty for over ten years until International Stores supermarket and car park were constructed here, opening in 1983. 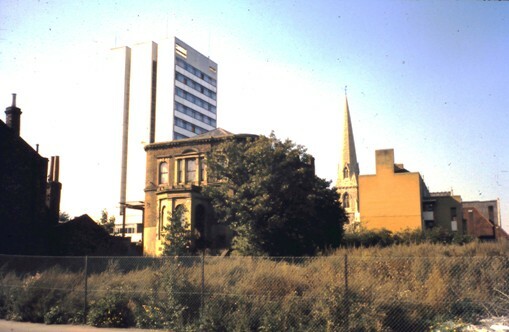 The tall block of flats behind the old chapel is the former police section house which opened in 1966 (S31). The end wall of St Paul's House flats is visible next to St Paul's.